I read where Dennis Willing is taking over the position at the NRA or Director of Competitions. 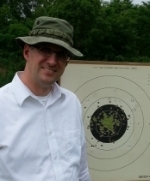 Dennis is a long-time accomplished bullseye pistol shooter. He was coordinator of the Bullseye-L picnic at Camp Perry for a number of years. His valuable contributions to our sport as an NRA Board Member and member of the pistol committee have directly benefited the sport of conventional pistol shooting. His years of being a referee have also not gone unnoticed. I am very happy to see someone so qualified, motivated and dedicated to competitive shooting rise to such a position in the NRA. Congratulations Dennis! Yes Dennis is a great choice! As a distant aquaintence of Dennis, and as a former shoulder to shoulder competitor, and as a recipient of extreamly valuable advice, and lastly as a student of his exceedingly applicable bullseye class, I want to wich the bestest for dennis in his future endevours. I was talking to the guy who I rely on when I want to know something about bullseye (Jon Nortemann) and he said this was a very good thing!